An Múinteoir Jen Uí Dhuibhir agus na páisti as ranga ceithre Scoil Garbháin. In recent weeks we were delighted to have a visit from ranga 4 with their teacher Jen Uí Dhuibhir from the local gael scoil, Scoil Garbháin. These children were very interested in local history and knew quiet a lot. They listened attentively as they were brought around the museum and asked questions along the way. 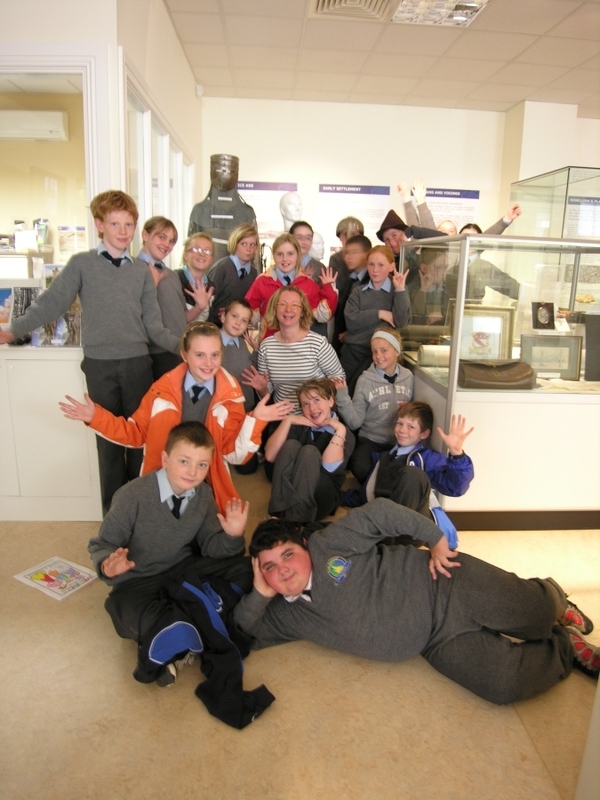 The second school to visit was 4th class from Scoil Mhuire along with their teacher Mary Harney and Principal Finbar Keohan. The children showed a special interest in our display on the Moresby as they were studying it in class. They also spent some time studying the many photographs of Edmond Keohan, who was grandfather to their Principal Finbar. We openly invite all the schools in the county to vist the Museum, they can partake in a guided tour by the museum staff or come and browse at their own leisure. The handling objects are always a big hit with the children, they love trying on the helmets or handling the sword and gun. The colouring pictures are also a big hit with the young and not so young. In the months ahead it would be great to see many more schools from around the county come and visit and see what the museum has to offer.